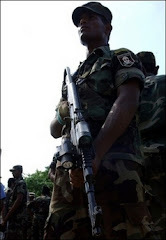 Mannar residents say that they have witnessed movement of strangers armed with weapons and fear that members of the DPU are on the prowl during nights in their villages in the Liberation Tigers held area in the Mannar district, civil sources said. Mullikulam residents are spending their night at St.Mary's Church, Silavthurai residents in St.Francis Xavier Church and Arippu families in a common ground in the middle of the village, sources said. Villagers have complained to Mannar Bishop and the Sri Lanka Monitoring Mission (SLMM) in Mannar, sources said.